The IMC Headset for open face and modular helmets features a two piece cord with everything needed to take advantage of the intercom/music system. Simply install the headset into your helmet, plug the DIN connector cord into your bike, and start enjoying your factory system on any adventure you may take. This kit includes a boom microphone for ¾ and full face helmets. This combo provides the performance of headsets costing twice as much. The rugged coiled connecting cord is designed for years of reliable service. The slim (6mm) speakers offer excellent sound quality and are easy to install. The special noise canceling microphone will make this a must-have for your next trip. •	Directional noise canceling boom microphone reduces ambient noise for crisp communication. •	No helmet modifications required for installation, boom microphone works well with all types of helmet. •	Flat panel speakers provide with metal casings provide great range of sound for music and loud, clear audio for intercom. •	Superior quality, the product is backed by a two year warranty. •	Speakers: Stereo speakers flat panel metal casing 6mm in depth. •	Microphone: Flexible noise canceling boom microphone. •	Connector: 7 Pin headset for Harley Davidson- Works with any Harley 7 pin system. 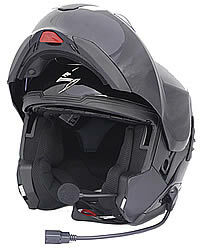 Now offering helmet headset installation and communication system installs on your bike while you wait.